Anyone who reads this book aloud without a pirate voice should be arrested. This book is told from the perspective of a first grader who sees the world through the lens of a pirate. The illustrations are ingenious - with life in first grade being in full color, and the pirate daydreams faded into the background. I'm thinking I need to purchase a copy of this book to read to my students on International Talk Like a Pirate Day. Even if you're not in first grade, you'd be hard press ...moreAnyone who reads this book aloud without a pirate voice should be arrested. 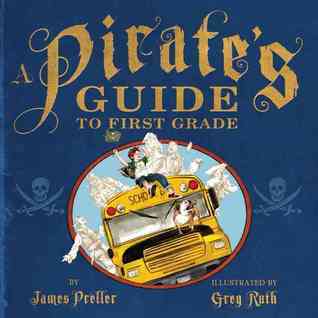 This book is told from the perspective of a first grader who sees the world through the lens of a pirate. The illustrations are ingenious - with life in first grade being in full color, and the pirate daydreams faded into the background. I'm thinking I need to purchase a copy of this book to read to my students on International Talk Like a Pirate Day. Too bad it's already passed by this year. Even if you're not in first grade, you'd be hard pressed to find a student who won't be entertained by this charming book. Oh my goodness! We so need this book! It looks positively adorable.